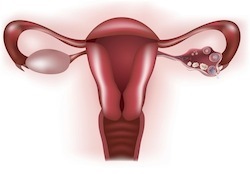 Adenomyosis is the thickening of the uterine lining caused by abnormal growth of endometrial tissue. Endometrial tissue grows in the outer muscle lining of the uterus causing painful, heavy menstrual cycles for some women. Researchers from the Royal Adelaide Hospital in South Australia studied potential effect of adenomyosis, diagnosed by ultrasound, on the outcome of in-vitro fertilization (IVF) with GnRH antagonist treatment. The study focused on 213 patients undergoing IVF treatments in a private setting. Of the 213 women, 17.84% (38 patients) had been diagnosed with adenomyosis via ultrasound. Patients were screened for IVF treatment between Apr. 2010 and Mar. 2012. After the first round of IVF, 44.6% of the control group conceived compared with 23.6% of the adenomyosis group. The adenomyosis group averaged two years older than the control group and infertile time was about four months longer. When researchers adjusted the pregnancy outcomes to account for the increased age and length of time spent infertile, the outcome remained statistically significant. Source: Thalluri V, Tremellen KP. Ultrasound diagnosed adenomyosis has a negative impact on successful implantation following GnRH antagonist IVF treatment. Hum Reprod. 2012 Sep 20.